In Section 4, the residual strength analysis was discussed which requires a material model describing the fracture process, the specific materials data that support the model for the structural thickness and loading conditions, and the ability to derive the value of the controlling structural parameter (such as the stress-intensity factor) for the cracked structure. There are a series of residual strength tests that can be conducted during the course of the design analysis and development test activity (JSSG-2006 paragraph 4.12.2) that will support the verification of residual strength analysis capability in aircraft safety-of-flight critical structure. For example, a manufacturer could choose to conduct some constant amplitude fatigue crack growth rate tests using radial-corner-cracked-hole type specimens or part-through thickness cracked type specimens in order to verify the stress-intensity factor analysis part of the damage integration package. Instead of cycling such constant amplitude tests to failure, the tests could be stopped prematurely and the specimens pulled to fracture. By monitoring these fracture tests and recording critical events as a function of load, the manufacturer can build a database that can be utilized to verify the applicability of various material (fracture) models proposed for the residual strength analysis. An example illustrating some of the initial steps in verifying the applicability of a new type of fracture model can be obtained from a review of the work of Wang and McCabe . One of the first steps in verifying any residual strength analysis is to demonstrate the transferability of the data between simple cracked geometries. Wang and McCabe considered the applicability of the R-curve (KR) analysis to the prediction of residual strength of aircraft structures. At the time of their study, there was almost no documentation that supported the transferability of R-curve data. 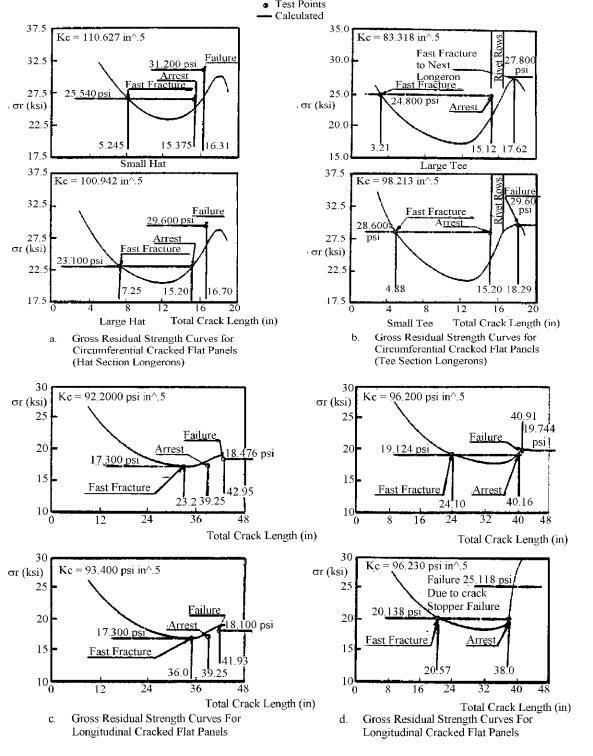 Wang and McCabe employed two types of crack-line-wedge-loaded compact [C(W)] specimens to provide the basic materials data and then performed a residual strength analysis on middle-crack tension [M(T)] panels. They also directly compared the R-curves from the two cracked geometries; Figure 7.4.6 describes one of their comparisons. The Wang and McCabe residual strength results are summarized in Table 7.4.2 and in Figure 7.4.7. They were able to predict the gross stress at fracture, i.e. the residual strength, on the average to within 5 percent (on the conservative side) of the experimental results. Their most non-conservative prediction was only about 8 percent higher than the experimental value. Determined Values In Middle-Cracked Panels. The next step in verifying the residual strength prediction model is through the testing of built-up (multiple-load-path) type structure. Such structures have the attributes of transferring load during crack propagation as well as of possibly arresting the running crack before a catastrophic failure of the complete structure occurs. 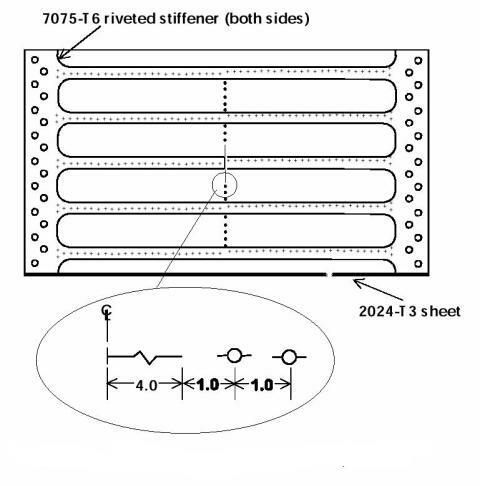 As discussed in Section 11, the development of an accurate value of the structural parameter K, the stress-intensity factor, requires that the structural analyst properly account for load transfer, joint deformations, fastener effects, etc. As such, the testing of built-up structures can result in the verification of the stress-intensity factor (or other appropriate parameter) estimates as well as the material failure model and its supporting data. As an example of results obtained to validate the use of a residual strength model for built-up structure with fracture arrest features, consider the work of Swift and Wang [Swift, 1971; Swift & Wang, 1970]. They tested extremely large flat panels with longerons and frames. The longerons were either T or hat sections. The frames were attached to the skin with shear clips; in some cases, extra tear straps were used as crack stoppers. Figure 7.4.8 describes a comparison of their predicted residual strength curves for four different configurations with the experimental results shown as points (initiation/arrest as appropriate). In most cases, the analysis was shown to be within 5 percent of predicting the experimental observation. Additional examples of residual strength verification tests for model transferability using single-load-path and built-up structures can be found in Liu & Eckvall , Verette, et al. [1973, 1977], Liebowitz , and Potter . A similar program was conducted by Dawicke, et al. . Under the auspices of the NASA Aircraft Structural Integrity (NASIP) and Airframe Airworthiness Assurance/Aging Aircraft (AAA/AA) programs, a residual strength prediction methodology has been experimentally verified for aircraft fuselage structures. 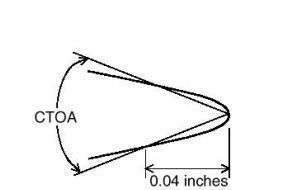 The fracture criteria selected for use on the (mostly) thin gage aluminum fuselage structure was the crack tip opening angle (COTA). A detailed description of the testing methodology used for determining the COTA is given in Dawicke  and Dawicke & Sutton . The COTA was selected to handle the diverse loading problems of large scale yielding, and significant stable crack growth which limited the applicability of more normal linear elastic fracture mechanics. Two finite element codes were used in the program: a) ZIP3D was used for the simple laboratory specimens which did not exhibit large out of plane displacements, b) STAGS, which is a nonlinear shell analysis code, was used for the residual strength analysis for larger specimens with large out of plane displacements. A typical fuselage skin material, 2024-T3, was used throughout the program. Specimen thicknesses were 0.040, 0.063, and 0.090 inches. The laboratory test results of the CTOA were used to predict the results from larger structural element and full scale structure validation tests. The final test in the series was a full size fuselage segment with combined internal pressure loading and axial tension loads to simulate fuselage body bending. 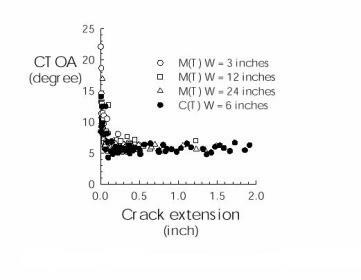 The CTOA fracture criteria projects that crack growth will occur when the included angle of the two crack surfaces (Figure 7.4.9) with respect to the crack tip reaches a critical value. The critical angle for a given material is nearly constant after growth exceeds the half thickness point, as shown in Figure 7.4.10. An increase in the thickness of the specimen causes a decrease in the CTOA, as shown in Figure 7.4.11. Another complexity that was introduced by using the STAGS 2D FEM was the necessity to account for the through-thickness constraint effects by using an approximation for the plane strain core (PSC). 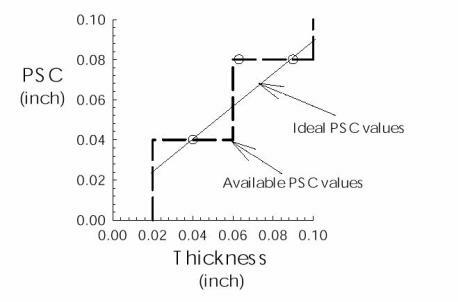 This approximation of the PSC height is nominally equal to or less than the specimen thickness (Figures 7.4.12 and 7.4.13). The report summarizes a successful application of the CTOA fracture criteria in conjunction with a 2D non-linear FEM model. The critical CTOA and the plane strain core (PSC) were acquired from small laboratory size specimens and the results were projected for wide panel (40 inches) (Figure 7.4.14 and 7.4.15) and full scale fuselage structural components. For a specified thickness, the predicted value to the experimental test value was within 10% for all the program specimens. 1.1) The damage tolerance requirements specify residual strength loads, Pxx, which are all on the order of limit load. 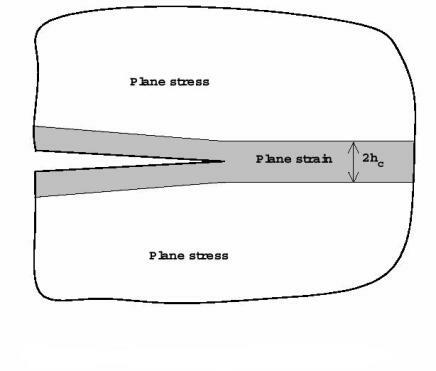 Stresses on the order of the limit load stress may occur seldom in the test stress history; they may not occur at all during the last part of crack growth. As a result, the cracks may grow much longer than the critical size associated with the stress level at the Pxx load. Then final failure will occur at a much lower stress. 2.2 Letting failure occur in the course of a crack growth test introduces a difficulty in determining the stress at fracture. If the loading is constant amplitude, it is reasonable to assume that fracture occurs at the peak stress. In variable-amplitude loading a series of low stress cycles may be followed by one high stress cycle during which fracture occurs. It is not certain now whether fracture took place at the peak or at a somewhat lower stress. 3.3) The critical crack size may be difficult to determine. Usually some crack growth has occurred since the last measurement. During the last cycles, crack growth may accelerate fast. This usually means that the fracture surface is very similar to that of a static fracture. As a result, the size of the fatigue crack at which fracture occurred is not well delineated on the fracture surface. 4.4) The crack growth at low stresses may continue so long that fracture occurs at a crack size that is too long with respect to specimen dimensions. A rational comparison with other test data is complicated due to the remaining ligament requirements and could be misleading. Therefore, it is useful to perform a controlled residual strength test near the end of the crack growth test. 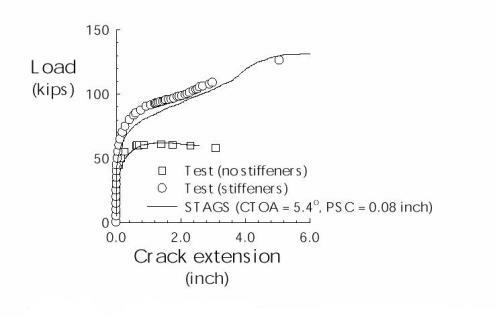 For this purpose, the critical crack size is estimated on the basis of the stress at the required Pxx. The test is discontinued when this crack size is reached. Then an appropriately instrumented fracture test is performed. In this respect, it is important that the specimen is of sufficient size. There can be no question about this when a complete component is tested. In that case, any size requirement is overruled.